The weather may have been too bad for a barbecue last night – hence my roasting the lamb with that wonderful stuffing – but it’s never too bad for ice cream. I’m sure you’ve gathered by now that I’m a big ice cream addict and buying the ice-cream maker a couple of years ago was one of my best kitchen buys ever. It has now taken up permanent residence in my freezer so a lovely ice cream is never too far away. Once you’ve mastered a basic vanilla – which you can flavour and add to in infinite ways – and a basic sorbet, like my Summer Sorbet, then you can really let your creativity fly. The farmers’ markets are full of rhubarb at the moment and it’s one of my favourite things. 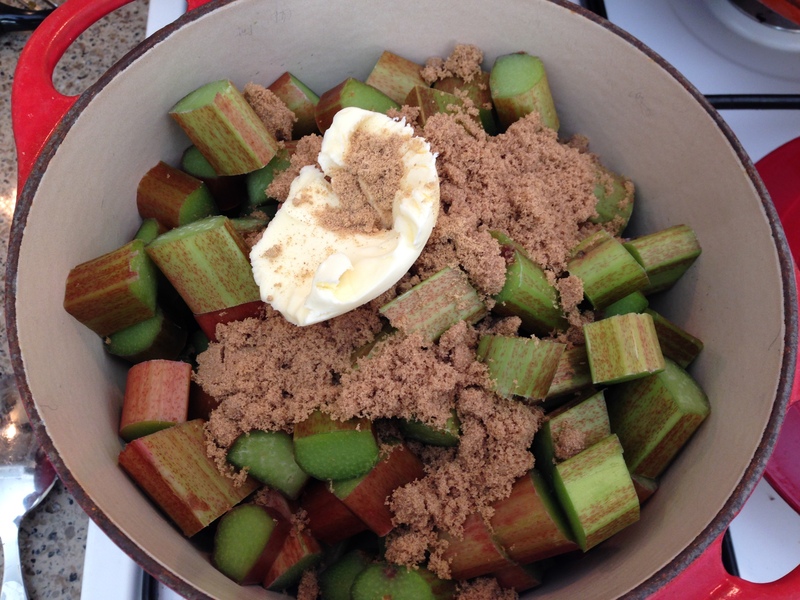 I always think of the huge patch we had in the garden when I was a kid and how I loved pulling it up when it was ripe, chopping off the huge leaves with a large knife, and slicing it into a saucepan ready to be made – most usually – into a rhubarb crumble. And rhubarb crumble seems so quintessentially English that it’s quite surprising to discover that rhubarb is in fact a vegetable – not a fruit – and a native of Siberia; it wasn’t used in English cooking until the late 18th century. Rich in calcium, potassium, manganese and vitamins A and C, it was known for its healing properties going back as far as 2700BC, being particularly useful for problems of the lungs, gut and liver. Certainly now it’s known for its ability to relieve constipation – which of course is a warning to not eat too much! You should never eat rhubarb raw as it is far too sour and its leaves are poisonous. It needs quite a lot of sugar or other sweetener to make it edible when you cook it but its sourness also makes it – like gooseberry – a wonderful accompaniment to oily fish and fatty meats. Gooseberries are often served with mackerel, for instance, but try rhubarb as an alternative. My mind was strictly on its sweet uses yesterday though and I wanted to bring its wonderful aromatic, slightly tart note to ice cream. And because of the tart nature of rhubarb, I decided to use double instead of whipping cream in my basic vanilla ice cream recipe for a richer custard. I also decided to make a rhubarb compote separately and stir that gently through the vanilla ice cream once it was churned to a soft peak consistency. I wanted the essence of the rhubarb to stand alone to a certain extent and not be churned into one homogeneous cream. First of all, I prepared the rhubarb. I’d bought two bunches in the market that morning that had 4 sticks each. I washed and dried it, cut off the ends and cut it into roughly 1.5cm pieces. I put the rhubarb in a pan with 3 heaped tablespoons of brown sugar (for a nicer, more toffee-like sweetness), a couple of tablespoons butter and half a teaspoon of ground ginger. Ginger goes wonderfully with rhubarb. Pour just a little bit of water in to cover the bottom of the pan and stop the rhubarb sticking while it cooks, but not too much or the compote will be too watery. Cook the rhubarb very gently with a lid on, stirring from time to time. 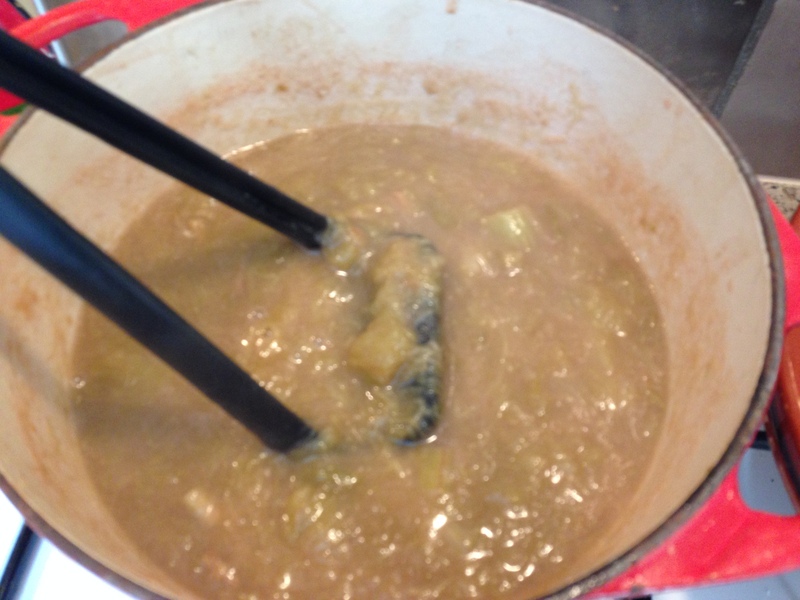 I let it cook until the rhubarb was falling apart. I turned the heat off and mashed it a bit with a potato masher. I chose to do this rather than use my hand blender as I wanted a textured compote not a puree as I thought that would be nicer in the ice cream. Check the sweetness and if it’s too sour, add a little more sugar while it’s still warm. Transfer the compote to a bowl and when it has cooled, put it in the fridge to get cold before you add it to the ice cream. Meanwhile, make the vanilla ice cream. 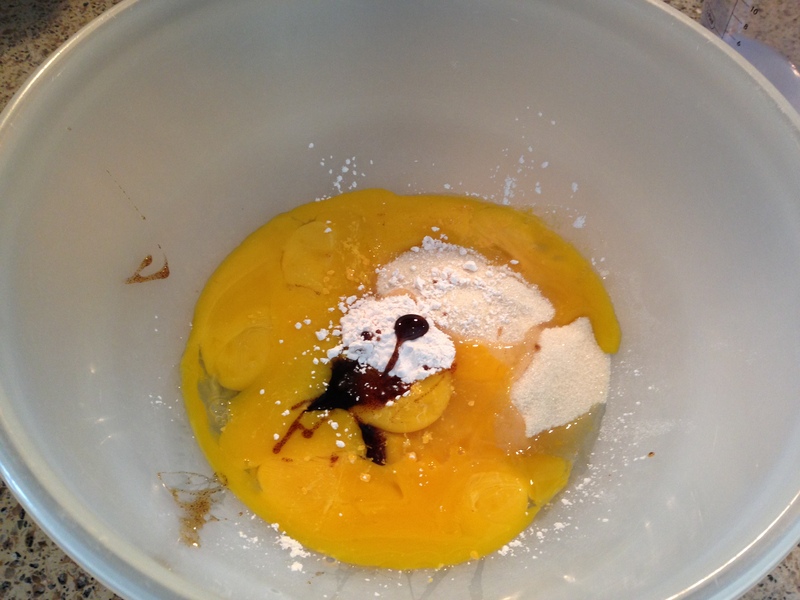 Put 6 egg yolks, 120g caster sugar, 1 teaspoon vanilla paste (or extract) and 1 teaspoon custard powder or cornflour (this stabilises the custard as you cook it so it won’t separate) into a bowl. Whisk it all together until thick and pale. Have ready 300ml milk brought to just a simmer and gently pour that into the egg mixture, beating all the while. Then transfer to a clean pan and gently heat, stirring all the time, until you have a thick custard. Transfer to a bowl and leave to cool. Once cold, whip 300ml double cream until you have soft peaks – but not very thick – and gently fold into the custard. 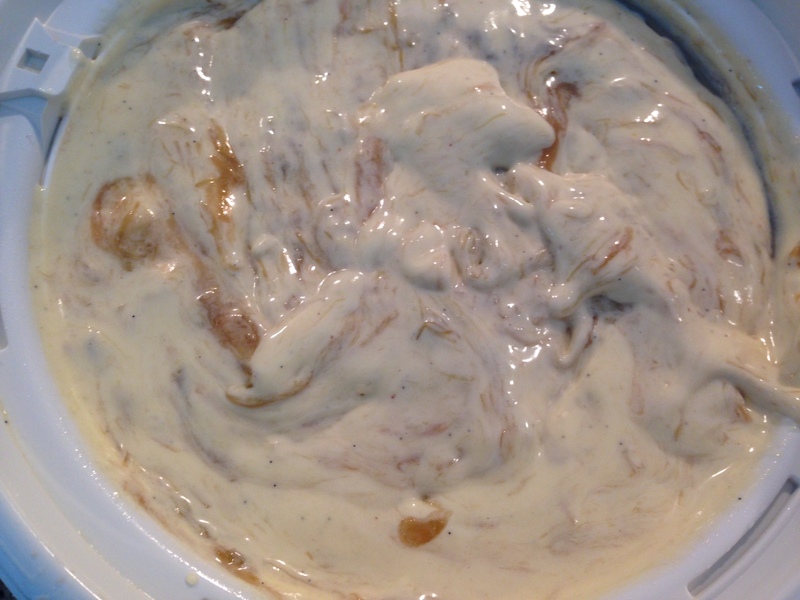 At this point I transfer the custard to a large jug so I can pour it more easily into my ice-cream maker. If you have time, let the whole mixture get cold in a fridge for half an hour or so as it makes the churning stage quicker and more successful, I find. But my ice-cream maker is just a small, basic home one so not very powerful. 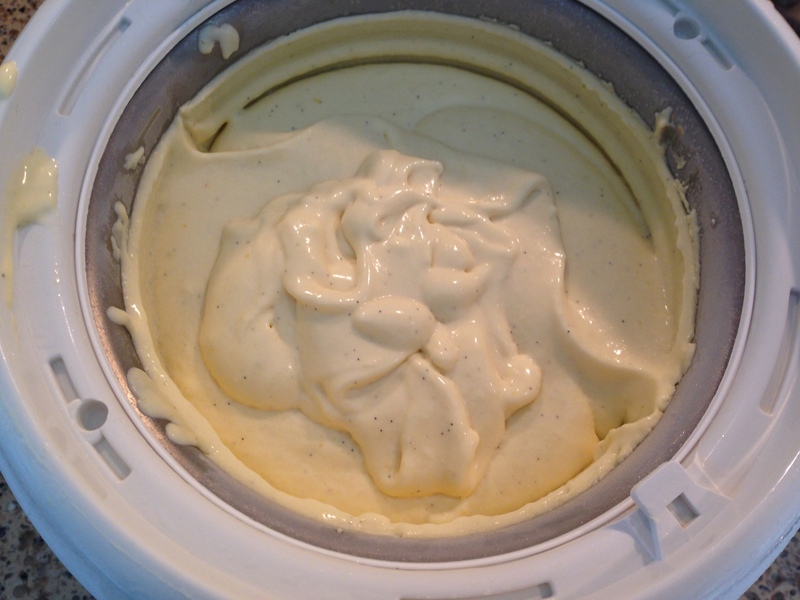 Get the ice-cream maker ready, turn it on and slowly pour the custard in and allow to churn until you have a nice soft-peak ice cream. This generally takes about 20 minutes. Now gently fold in 400ml of the rhubarb compote. Transfer to a freezer container and freeze until more solid and ready to eat. If you freeze it well in advance of eating, you will need to take it out of the freezer for a few minutes to soften a bit before serving. 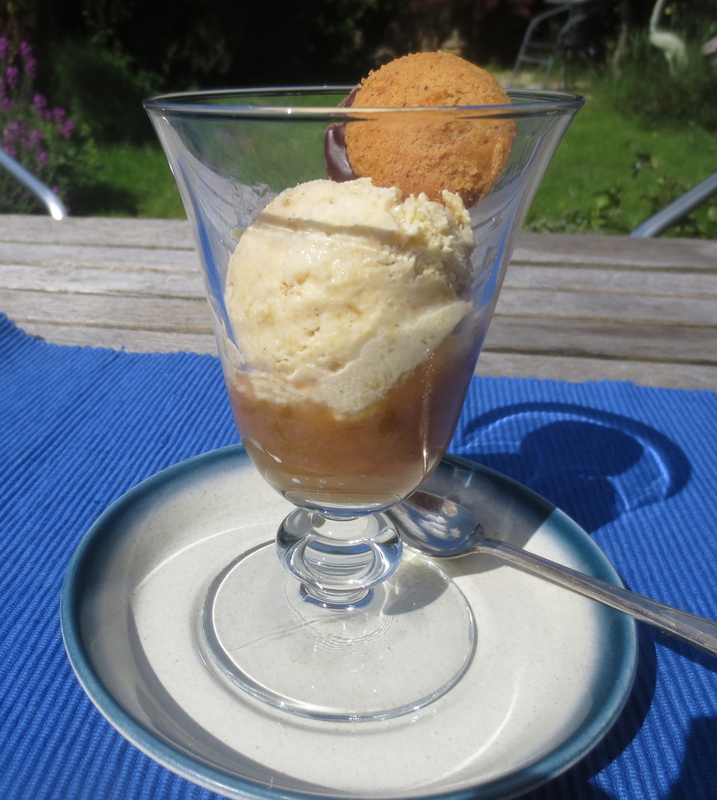 I had a little of the compote left to serve with the ice cream and one of the delicious baci di dama biscuits I buy in Carluccio’s (and have become seriously addicted to; try them with an espresso!). The ice cream was a great success. The rich creaminess of the vanilla ice cream was beautifully balanced by the slight tartness of the rhubarb. Gently swirling the compote through the cream had left the rhubarb flavour clear and distinct. Really – modesty aside – it was wonderful. And Jonathan and Lyndsey thought so too. Seconds were in order! I’ve never been particularly adventurous with rhubarb before. It’s here for a short season and I do love rhubarb crumble still so I tend to make that. But I’m so glad I’ve discovered how good it is in ice cream. I can see this will be a regular addition to my ice cream repertoire! I love rhubarb desserts, and this ice cream sounds fabulous! Thank you! It had a really good rhubarb flavour and nice and creamy too. 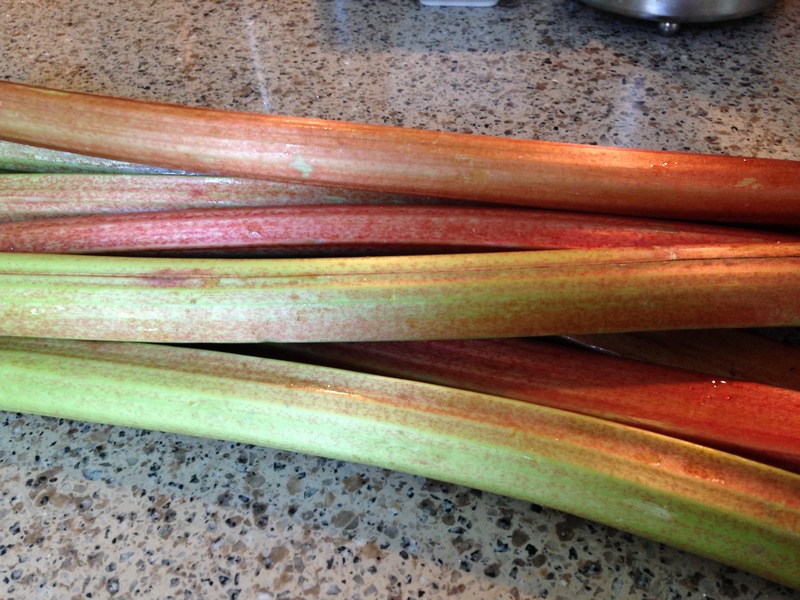 We did used to eat raw rhubarb as children with a bowl of sugar to dip the stalk into! Oh gosh! I assume quite young rhubarb? And that you liked it?